The ponytail goes glamorous! Fancy ornaments set with faux pearls and sparkling crystals decorate black, no-snag elastic bands. 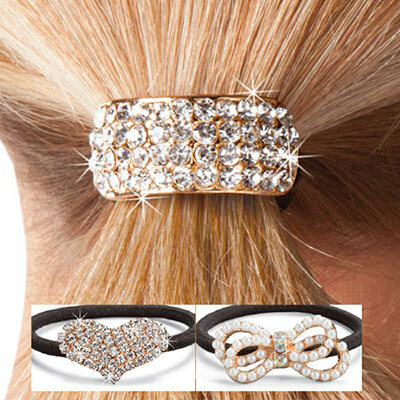 Set of 3 Blinged-Out Ponytail Holders includes: pavé bar, faux pearl bow, crystal pavé heart. I have been looking at these ponytail holders for a friend for several years and finally decided to buy them this Christmas. What arrived was a package someone had sent back to Paragon with three items all broken and most likely used! I had two bows and one heart. I called customer service and explained my situation. There were no questions asked about replacing my order and I didn't even have to send the damaged goods back! They even apologized for having the item arrive late. (Not a problem for me.) I will say it seems rather nasty to do a switch like that for fake glitter!